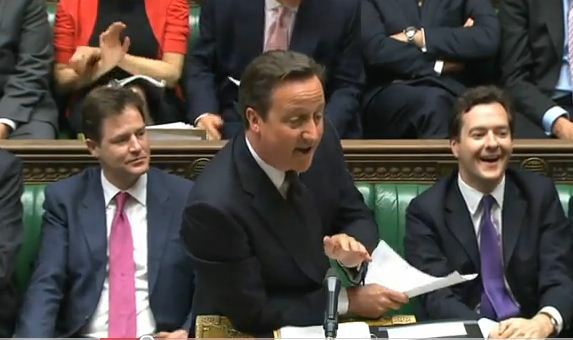 Yesterday in Prime Minister’s Questions David Cameron made a remark that seems to have sparked uproar through the Labour party when he told Labour front bencher Angela Eagle to “Calm down dear!” in a Michael Winner style. I don’t agree that he should have done it and it is very patronising to a fellow MP, and could be classed as sexist but I was more intrigued at the actions and expressions of the two closest people to David Cameron. His fellow Eton chum, George Osbourne was merrily laughing away as if it was some public school boy jibe while Nick Clegg looked all together more serious with a small grin, but on the whole looked a bit ashamed. There seems that after a year working as the deputy prime minister as part of the coalition, things aren’t so rosey and I can imagine that Cameron and Clegg are becoming further divided in the Cabinet especially as more issues cause differences of opinion. Below is the full video of the events from the House of Commons yesterday. This weekend we took the kids to Jersey for a short break and we had a really relaxing time. We’d never been to Jersey before and one of the things we have set out to do is to take the kids to lots of new and interesting places and cities as often as we can. Jersey is a small island in the English Channel, close to France and is just 9 miles long and 5 miles wide. It is similar to the Isle of Man that we visited 2 years ago as it has its own government, still has a connection with the UK, but mints its own currency and is an offshore tax haven. Jersey was occupied by the Germans during WWII so there is a big war connection on the island. There are lots of big houses and expensive cars and the island’s maximum speed is 40 mph. It seems quite an over populated island and Dave described it as a “rich list” housing estate. There are lots of Jersey Royal potato fields and apparently lots of Jersey cows (but we only saw about 8). Today we have launched a new design for my blog to give it a fresh look, with new functionality for 2011. My blog is just over 2 years old now and the old design lasted me well, but Kean has been busy behind the scenes and inbetween client work has been coming up with a whole new look. I really love my new site and its stretchy to fit all sizes of browsers and mobiles. Back in 2003 on the 4th April we bought Bronco and were sat in the solicitors office signing all of the papers. Its a really special day today as its our wedding anniversary too. 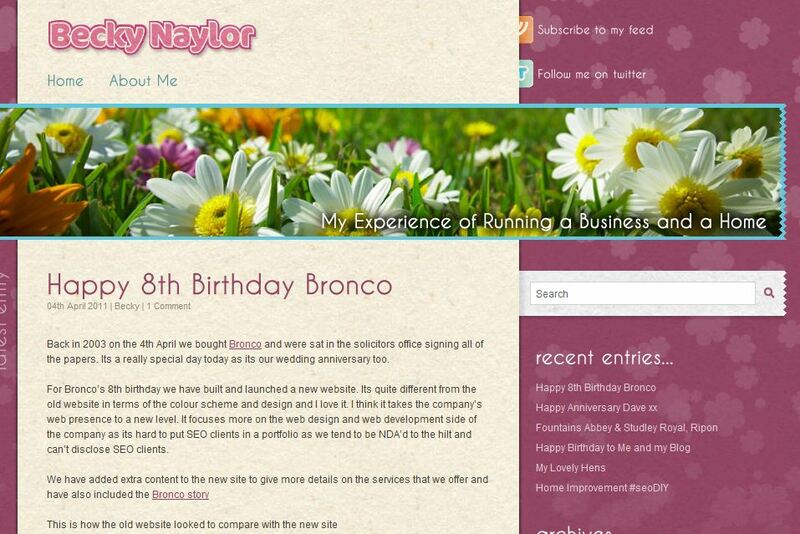 For Bronco’s 8th birthday we have built and launched a new website. Its quite different from the old website in terms of the colour scheme and design and I love it. I think it takes the company’s web presence to a new level. It focuses more on the web design and web development side of the company as its hard to put SEO clients in a portfolio as we tend to be NDA’d to the hilt and can’t disclose SEO clients. Today is 13 years since I married Dave back on the 4th April 1998. We chose to save all the complications that come with arranging a wedding and headed up to Gretna Green in Scotland to tie the knot. Tradition had it that couples would elope over the Scottish border to get married by the blacksmith often being chased by their parents who disapproved and Gretna Green is the closest Scottish town to England. To us it wasn’t about spending tens of thousands of pounds on one day in our lives but more about the actual meaning of getting married. I think in total we spent about £400 on the day.